Join Tabz, Kim, Hannah, Nuchtchas and Jessa as they discuss Joss Whedon’s Much Ado About Nothing. Much Ado About Nothing Q&A’s on Joss’d: Recording 1 and Recording 2. Join Tabz, Heidi and Larissa as they discuss bad plot lines from Buffy, Angel, Firefly and Dollhouse (okay we slip in Doctor Horrible and Sugar Shock too). Join Tabz, Emma and Nuchtchas as they talk about the bad girls of the Whedonverse from Darla to Adele. Let’s Talk Joss Episode #007 – Penny: Too Good to be Real? Join Jachelle, Emma, Stephen Jacob and Tabz as they discuss Joss Whedon topics live from Las Vegas at the New Media Expo this past summer! 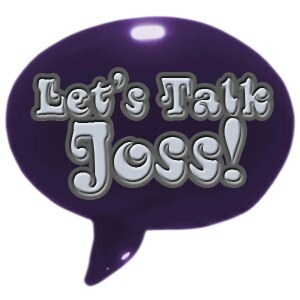 Lets Talk Joss #002 – Never Mind the Reavers! Nick Edwards (The Signal, Sending a Wave, Buffy Between the Lines, Joss’d), Kim Butler (Buffy Between the Lines, Joss’d, Upside Down & Halfway to Happyland), Emma Rawlin (Buffy Between the Lines, Joss’d), Ginger Campbell (Brain Science Podcast and Books & Ideas Podcast), Larissa (Buffy Between the Lines) & Tabitha Grace Smith (Buffy Between the Lines, Tales from the Verse, Strangely Literal, Joss’d, After Serenity) discuss the Reavers from Firefly. Oh, and Tabz’ cat (Myboyfriend) decides to join in too.